BrewCity CrossFit is a fitness training facility located in downtown Milwaukee that employs the CrossFit method of strength and conditioning. We believe that the modern day fitness industry and big commercial gyms have failed most people. With CrossFit, you can achieve real, functional fitness and have a lot of fun while you're at it. At BrewCity CrossFit, our mission is simple: give our members every opportunity to become fit beyond expectations in an environment that is effective, fun, and quintessentially “Milwaukee.” Founded in 2011, we pride ourselves on our experienced coaches, our robust class schedule, our tough and intelligent workout programming, our fantastic facility, and most of all, our amazing community. Whether you’re brand new to working out, or a competitive athlete, you’ll be glad you joined BrewCity! camaraderie for anyone willing to put in the work. CrossFit is a fitness program that is designed to be broad, general, and inclusive. Practitioners of CrossFit specialize in not specializing. The CrossFit methodology is designed for universal scalability, which makes it the perfect routine for any committed student regardless of experience, from cage fighters to grandmothers. Many police academies, tactical operations teams, military special operations units, champion martial artists, and hundreds of other elite and professional athletes worldwide incorporate CrossFit into their strength and conditioning programs because it works. Our members are extremely diverse in their experience, conditioning, and lives. BrewCity CrossFit is a community. Our atmosphere is one of support and camaraderie for anyone willing to put in the work. CrossFit incorporates a variety of exercises including Olympic and power weightlifting, gymnastics, body-weight movements, running, rowing, and many other elements. We don’t have exotic weightlifting machines, treadmills, flat screen TVs or mirrors. We do have pull up bars, kettlebells, medicine balls, gymnastic rings, barbells and dumbbells. We have lots of floor space for push-ups, sit-ups and plyometrics. We have tires for flipping and ropes for climbing. Workouts often include several exercises performed back to back and for time. If you have more questions, check out our Frequently Asked Questions page. 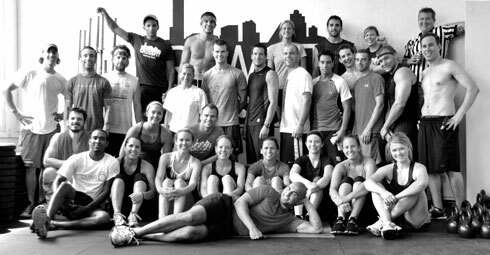 If you can't find the information you are looking for, email us at info@brewcitycrossfit.com, or call us at 414-207-7851.